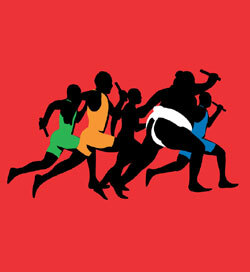 Before I write too much about my run today, I saw a funny t-shirt for sale over at Threadless.com, and it is only $5! I am not sure if I will actually buy it or not, but I thought it was funny, we’ll see. So today I headed out for my first back-to-back run since the half. I haven’t wanted to overdo it, but I won’t be able to run on Friday. I started out on my typical route until I ran into an older woman plodding along in front of me who turned down my route. I always feel bad passing slower runners, goodness knows I have been passed enough times. It is not really a big deal if you are comfortable in YOUR run and what YOU are doing, but there is a little something that bugs me when I get passed. So I decided to not run through the Reed parkway and instead go one block west and run streets. This put me at the college in a different spot and closer to the west canyon bridge (I normally first cross the east bridge.) Then instead of looping around the other bridge, I decided to loop the other direction and run through the canyon. The canyon path gets muddy in our wet winter weather, but I figured a dry week ought to make it ok, plus I wanted to check to see if my buddy and I could still run it this weekend (his first run in years, and it is supposed to snow!) So through the canyon I went. The route change added about a half mile to my run. As I checked my watch coming back out of the canyon, I set a mini goal to make the full run in under an hour. I missed it by 90 seconds, running my string of missing running goals to two. Oh well, no biggie, on to the next! I have been drinking a whet-based protein powder drink soon after every run. It really gives me a boost in energy and is supposed to facilitate the recovery process. You mix one giant scoop with 3 ounces of water and get this thick chocolaty drink (they also have vanilla at Trader Joes). I like it a lot and have become an advocate. Seems to work really well. And considering I tend to have a diet that is somewhat low in protein anyway, it is good for me. Next I’ll try the vanilla.